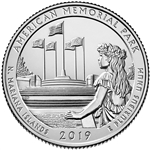 The American Memorial Park Quarter's reverse design depicts a young woman in traditional dress at the front of the Flag Circle and Court of Honor. She is resting her hand on the plaque whose text honors the sacrifice of those who died in the Marianas Campaign of World War II. Inscriptions are "AMERICAN MEMORIAL PARK," "N. MARIANA ISLANDS," "2019," and "E PLURIBUS UNUM." Our rolls are unsearched for the rare "W" Mint Quarters. 2 Million "W" coins were made, and mixed in with the Denver and Philadelphia Mint coins for each of the 2019 National Park Quarters. Happy Hunting!